Available for all dial owners and other sundial makers both private and commercial. There are only four times a year when a sundial indicates time exactly to your watch. This difference between sundial time and clock time is termed the 'EQUATION OF TIME'. I have carefully plotted the equation of time to produce a solid brass engraved plate 2 1/2 inch x 3 3/4 x 1/8 thick. Supplied pre-drilled with number 4 size raised countersunk brass screws. 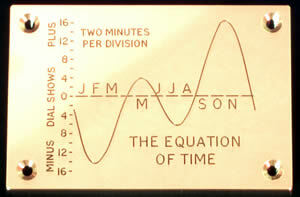 The equation of time was previously better known than it is now, as in centuries gone a mechanical timekeeper would be set by means of a sundial in conjunction with the time equation, thereby indicating the appropriate time difference. Accurately plotted, carefully engraved. An unusual though highly relevant accessory for any sundial. I only supply this direct, price £121.00 each. including 1st Class Mail in the UK and small packet airmail for overseas customers (please add 20% vat for EU only). Invoice issued to cover the transaction, money back guarantee.